The working-class town of New Glasgow is one of those places that many tourists pass by on their way to and from Cape Breton but few actually stop to see. This isn’t surprising because New Glasgow and the surrounding area – encompassing the small towns of Trenton, Stellarton and Westville – is short on outstanding sights. Nearby Pictou and Antigonish are infinitely more charming but if you have a couple hours to kill or just want a break from driving, there are a handful of things to take in. Topping the list of interesting attractions is the Museum of Industry in Stellarton, a great way to explore the area’s industrial heritage. Traditionally locals have been employed in the steel, paper and mining industries. While in Stellarton, watch for their distinctive painted fire hydrants, dressed up as policemen, penguins and everything in between. In downtown New Glasgow, you’ll find a small marina and the Samson Trail – a 4km walking path along the East River that runs through the heart of the town. It traces the bed of Canada’s first iron railroad. Melmerby Beach is a popular swimming spot, 16km out of New Glasgow. It’s packed on summer weekends. Also just outside New Glasgow is Magic Valley theme park, a good stop for the kids. It also gets very crowded on hot days and is a bit dated in spots but the water slides keep most young ones happy. This 4-day celebration at the end of July has been going for over a decade and always attracts a big crowd. Maritime musicians feature strongly at the Jubilee and the value for money is excellent: just $15 for a day pass or $45 for the whole weekend. You wouldn’t expect Chinese dragon boat racing in a Scottish town but it happens in Nova Scotia. 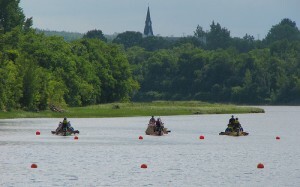 Over 40 teams race their colourful boats down the East River on the second weekend in August and there are also buskers and other family activities during the party. New Glasgow’s headline event for over 50 years, the Festival of the Tartans is where you can see pipe bands and highland dancing, learn about researching your Scottish roots and get a taste of that famous Scottish dish, haggis. It’s held in early August, around the same time as the Dragon Boat Festival.